I found a really fantastic toy store the other week when I was trying to avoid traffic. I ended up spending an hour there looking and playing with toys, and I found an incredible amount of science kits. 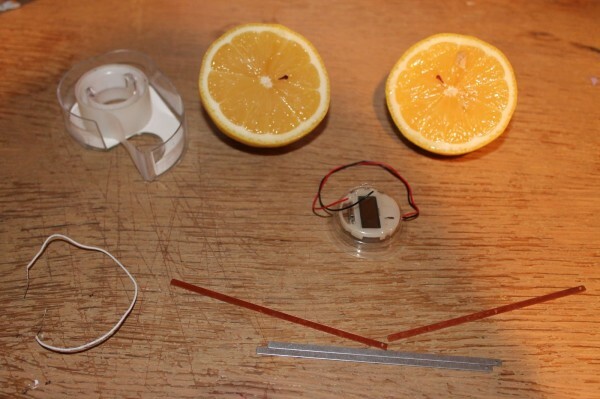 One of them was a Lemon Clock, so when I went grocery shopping I grabbed a lemon so I could “discover the science of batteries”! 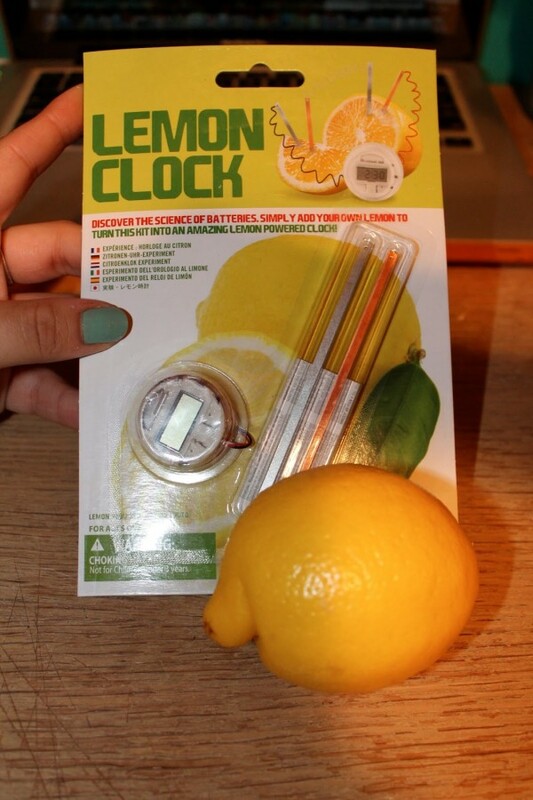 You can find these kits on Amazon, there are also Potato Clocks but you can use a lemon for the potato clock, or vice versa since it’s the same exact experiment! 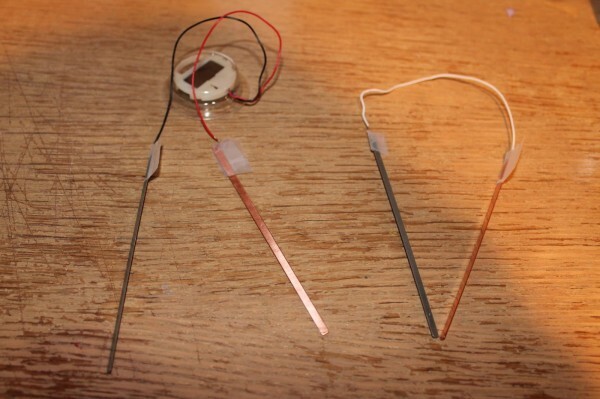 The kit comes with an LCD Watch, three wires, two copper plates and two zinc plates. You will also need some basic adhesive tape, like scotch tape. The instructions were so simple; connect black wire to zinc plate, red wire to copper plate, then connect the white wire to the two other plates. Tape the wires down. Then simply insert them into the lemon as shown below! Even though I knew this was going to work, it was still really cool watching the clock work. I love the feeling of a successful experiment. I get the same feeling when I complete a complicated math problem! The copper plates act like the positive electrodes in a battery; they are plated with metal less reactive than zinc. So when both plates are inserted into the lemon, there is a chemical reaction that takes place. Electrons move from the zinc to copper plates, creating an electrical current! 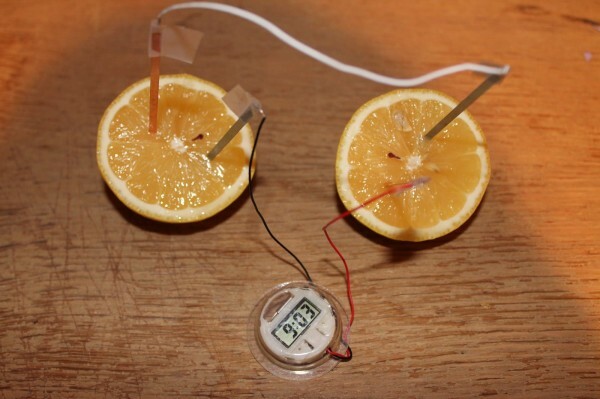 The juice in the lemon conducts electricity, making this current possible. You can also use grapefruit or oranges for this experiment since they all contain citric acid which is a great conductor of electricity. A potato works because the mild phosphoric acid present in the potato also acts as a conductor of electricity!